Most golfers, even if they are creatures of habit and never venture away from their home course, need to learn to hit from varying sand texture. At some point the sand will get wet, making it more firm than it usually is when it's dry. Wether you play on corse river sand or light, fluffy beach sand, chances are you will not always play from identical texture. Unlike on the PGA Tour, the average Joe has to deal with texture changing even from hole to hole on some courses! The first step is to make sure you have a wedge that is suited for the course you play most often. It's not a bad idea however, to have a back up wedge in case you travel to courses where the sand is the polar opposite from what you are accustomed. 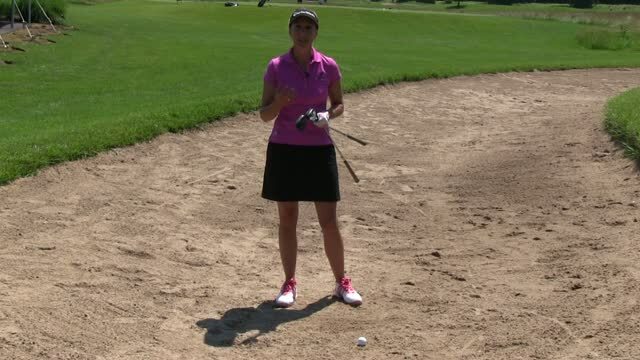 For firm hard sand, you will need a wedge with less bounce. The bounce is the back or skidding edge of the wedge. The front edge or leading edge is the digging edge. When you encounter hard or wet sand, you don't want the back edge to hit the ground first and cause your club to bounce quickly off the sand, blading the ball. For soft fluffy sand, the last thing you want is to dig too deep and get stuck in the sand. Therefore, a wedge with more bounce would be ideal. The bounce will help you simply smack the sand with the back of the club head and skip right through it. To hit successfully out of soft sand open your club face as much as possible to prevent the leading edge from digging and getting stuck. Play the ball forward of the center of your stance so you will catch it more on the up swing. The more shallow the angle of attack, the less sand you will take. This is ideal for preventing a heavy hit out of thick fluffy sand. For skilled players keep your weight centered. For higher handicappers it may be safer to lean your weight on your front foot to prevent falling back and getting stuck on your rear side. This will cause you to hit too far behind the ball. Be careful not to dig your feet in too much. The deeper you dig in, the more sand you will take. To master firm sand, square your club face so that the leading edge will dig and help you to catch some sand between your club face and the ball. Dig your feet in deep. Play the ball a little bit back of the center of your stance. This will allow you to hit down and catch more sand between the ball and the club face. Place your weight forward. This will provide a steeper angle of attack, again allowing you to take some sand and help kill the shot. Because of the nature of firm sand and the adjustments we make to our set up, plan for the ball to come out lower and with more roll. It will be difficult to get the ball to spin. Therefore, I recommend a smaller and more relaxed swing.